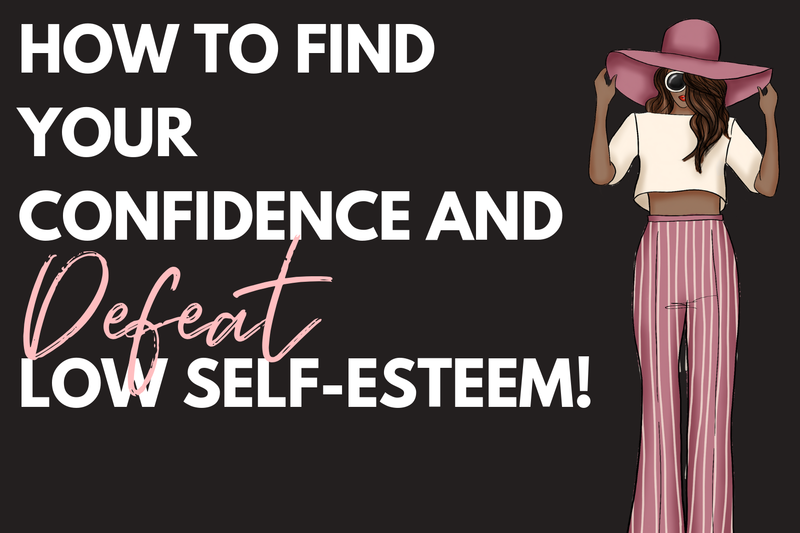 How to Get Rid of Low Self-Esteem and Finally Gain Confidence! Is it possible to Gain Confidence when you've always had low self-esteem? Becoming a confident person isn't a one and done type of deal! It's a process that you have to constantly work on. No one can give you that confidence. You have to make up in your mind that you deserve to love every part of YOUR BEING! Yes you have flaws, yes you make mistakes, and yes we fail sometimes but that's what is a part of you being here on this earth is for! You have to learn to accept the things we can't change and change the things we can. This past couple of months as I've stated in previous post has been quite a struggle. From dealing with worthlessness to dealing with my past failures and the present struggles...it's been tough! I'm not afraid to tell you! However as of today I'm stopping the mental process of discouraging myself and finally breaking free of what has held me bound for so long! Will this process be easy....HECK NO!!! Will I constantly revert to my insecurities...HECK YES! It's not easy taking what has been stuck in your head for so long and trying to change it. Nobody...but you can change how you see your life. Sometimes we have to get tough on ourselves. Why I'm finally making it a process to change? Well I've found myself allowing my mind to over think about situations, people, and my past. I've allowed what people say hurt me to my very core. I've allowed past situations to have a profound effect on me. I allowed my passion to take a back burner, My goals and dreams laid in a corner tucked away from my insecure mind. I didn't like who I was becoming. I became desperate for love and compassion from anybody and everyone that I forgot that I'm the only person that can give me 100% accurate love. I want to become confident in myself for me...not for anyone else! What I'm not gonna do. I'm not gonna become an egocentric person that lives on tearing people down that have insecurities. Instead I will build them up and make them feel worthy even through a smile, compliment or gesture. Sometimes the problem with some overly confident people is that they have come from an insecure past and they feel as though they must point out every flaw in someone who is still trying to work on themselves. This world is so full of hate and I just want to spread love. That's why I will never bully or pick on someone even if you think it will help...it won't! If you are feeling the same way and have gotten fed up on living a life filled with insecurities, past hurts, present struggles then you are standing in an army filled with love and compassion. Make the decision in the comments below to change for the better! I challenge you to write out all of your strengths. What are you good at? If it's only one thing write it down and then perfect the mess out out of it! Everyone has something they are good at! Whether it's writing, photography, talking, listening, giving advice, fashion, make up, or even just the simple things as loving people(not many people can love without judgment). At the start of the day or week write out a to-do list of things you would like to accomplish for that day or week. By writing and checking out every achievement on your list you are adding another visible boost to your confidence! I'm constantly surrounded by new people everyday and this has really helped me gain confidence in talking. However I want to get better at small talk so this is what I want to achieve each week. Most people are super friendly and even if they aren't...hey you tried and that's all that matters! Keep a smile on your face and keep it moving! Find group activities to get involved with! This is one thing I really want to work on. Even if I have to go outside of my small town to find those group activities. Getting out and about and trying new things lets your mind see that you are actually DOING SOMETHING to overcome the insecure mind. The mind has to adjust to new things whether it likes it or not...you have total control! Stop saying no to everything and get out and do it! You'll never know what you are capable of until you just try. I'm speaking to myself with this one too! I've turned down opportunities and parties, and get-togethers because I was not confident in myself to go out and just have fun. Go out and have fun stop overthinking and live in the moment. Good body language is a must in establishing confidence with others. I used to hate looking people in the eye or smiling at someone. Now I'll burn a hole in your eye sockets haha just kidding! I've learned to work on my body language. Sometimes I find myself reverting back into a little ball when I get nervous but I have learn to stretch it out, get my posture together, stop fidgeting, and just breath. There's power in just breathing! There is so much more to learn with confidence so during this month I'll be helping you as well as myself take back our minds and be on our way to a more confident self! Like I said it's a big freaking process that takes a while but each day it gets a little easier. Each step is a step of confidence. Each positive thought is a thought that will save you from a life filled with overthinking, sadness, and depression. Will you still have bouts of discouragement...yes. However, remember its ok to feel that way because WE ARE HUMAN and as a HUMAN we can also overcome it! What do you need to work on in order to be confident in yourself? Thank u so much!!! U r so right!! I love this post Jasmine so prod of you uou have come a far way!!! Awww thank u so much!!!! U r a great inspiration to keep going! Oh, I wish you wrote this when I was struggling. But, yes it's possible to be confident again. The key is to love yourself in its truest sense. Thank you! I know it all to well definitely baby steps! It's such a long process but so worth it!